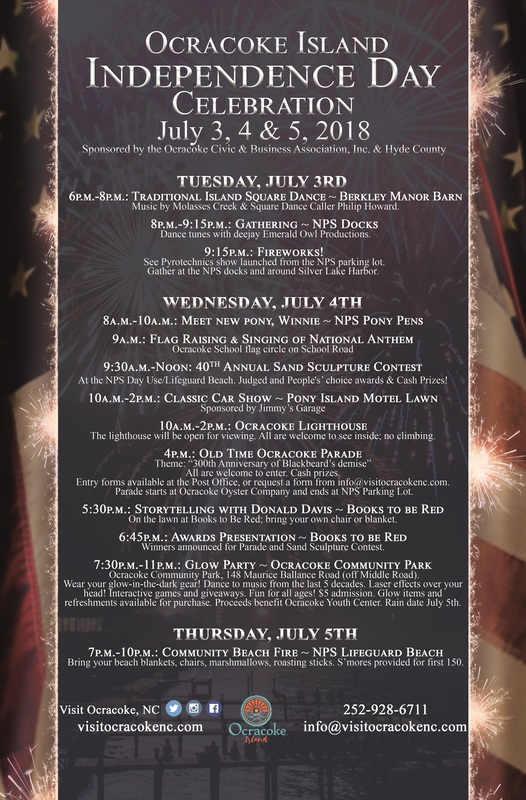 The festivities kick off Tuesday, July 3, with the famous Ocracoke Square Dance and a fireworks show to be seen from beautiful Silver Lake. The fun continues July 4 with a full day of activities, featuring the Sand Sculpture Contest, a traditional hometown parade and then something new in the evening – a Glow-in-the-Dark Laser Effects Show and Dance Party. Festivities conclude Thursday, July 5, with a Community Beach Bonfire finale. 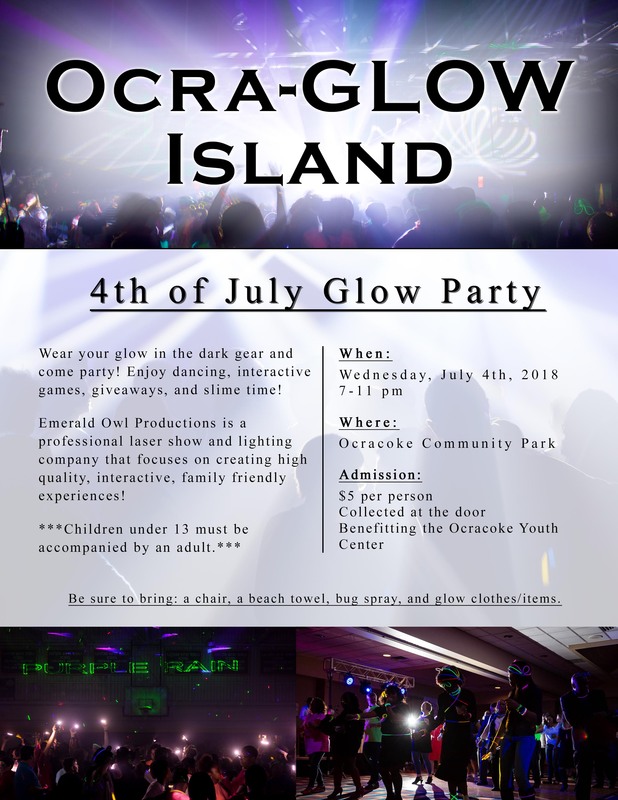 Ocracoke Island is the only destination that combines a relaxing beach vacation on miles of untouched National Seashore, with three days of 4 of July celebration within walking distance of your accommodations. Tuesday, July 3, begins with a traditional Ocracoke Island Square Dance at the newly built Berkley Manor Barn from 6 to 8 p.m. with music provided by Molasses Creek. At 8 p.m., Emerald Owl Productions deejay will spin dance tunes and patriotic songs at the NPS docks for the pre-fireworks gathering. At 9:15 p.m., the island will host a spectacular firework show that can be viewed from Silver Lake Harbor. The fireworks will be launched from the large National Park Service parking area (closed for the fireworks), located at the southern end of the island. Hyde County sponsors the show in conjunction with the Ocracoke Civic & Business Association and the National Park Service. Spectators are encouraged to arrive early and gather anywhere around beautiful Silver Lake harbor for awesome waterside viewing. On Thursday, July 5, join in the finale event at the “Community Beach Bonfire Under the Stars” from 7 to 10 p.m. at the Ocracoke Day Use Area/NPS Lifeguard Beach. Bring your beach blankets, chairs, marshmallows, roasting sticks. S’mores will be provided for first 150 attendees. 2018 Parade Entry Form or click here to register online. 2018 Sand Sculpture Contest Guidelines or click here to register online.